While we all love trees, we don't always love them on our property. Beautiful and majestic, trees provide us with shade, oxygen, and lush greenery. But they also can drop seeds, berries, leaves, pine cones, helicopters, and other nuisance debris - not to mention posing a very real safety risk if the proximity of these trees is precariously close to our home. When this is the case, taking on the task of cutting down the tree on your own can be both daunting and dangerous. This is when you need the professionals to help. We start the tree removal process by fully assessing your property and well as neighboring properties. We'll asses for power lines, utility poles, and other potential obstructions, such as underground cabling. When it comes to tree removal, we'll surround the area for protection. We'll take down low lying branches, and start an undercut on the trunk. We'll choose the precise location for the backcut, and guide the tree down away from your house in a safe, and meticulously calculated manner. We'll also provide stump removal and land fill. By the time we're done, you'll hardly notice there was a small army there removing your unwanted tree! By getting rid of nuisance trees on your property, you'll eliminate falling debris (and subsequently, more yard work! ), the safety risk of falling trees and branches, and allow the sunlight in your yard and home. 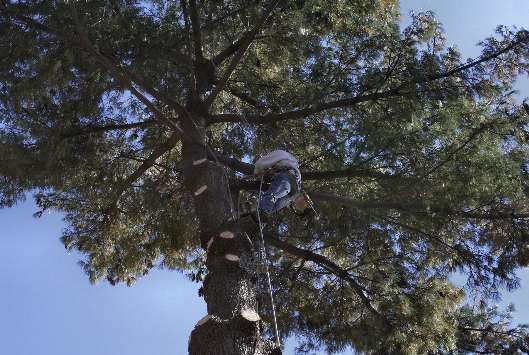 But don't take on the task yourself - trust the professionals with the real know-how of tree removal. Question: How much does it cost to remove a tree from my property? Answer: It depends on the size and location of the tree. If we can easily gain access to the tree and there is no danger of it falling on your house or your neighbors house than the cost is much lower than if it is has the potential to fall on your home and your neighbors home. When a tree has to be taken down in stages it requires much more time and labor to remove the tree. The cost to remove a tree also depends on how difficult it is to store or remove the logs. Some people choose to keep the wood for their fireplace and others wish to have the tree taken off property. This also has an impact on the cost. Question: How long does it take to remove a tree? Answer: The answer above is where you should begin. It all depends on the size and location of the tree. It can be one day or several days. We are available 7 days a week and are more than happy to come out to give you a free estimate.